Greenleaf Book Group, 9781608324026, 286pp. Why is a great company culture so rare? How can you make sure your organization has one? The good news is that creating an inspiring and sustainable culture is not as hard as you might think. 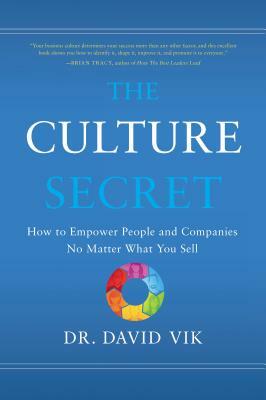 Dr. David Doc Vik reveals the keys to success in "The Culture Secret." If you don t think you have to focus on attracting and retaining the best employees in today's hypercompetitive war for talent, you are living in the past. The employees and customers of today have a choice and a voice. The secret to culture is simple: take care of your people, never stop innovating, and leave customers wowed. Build a better culture to secure the future for any organization. David "Doc" Vik, known as The Culture King, is the author and founder of The Culture Secret (theculturesecret.com). As coach at Zappos, Vik helped to drive the culture that received worldwide attention and was featured on 60 Minutes and Dateline and countless other national media outlets. His culture techniques and strategies have helped companies in many different business sectors attract and retain high-quality, engaged employees and loyal customers, enabling them to grow at unprecedented rates.